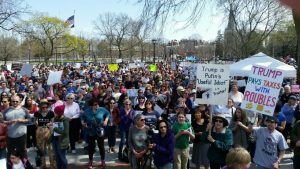 Around the country people hit the streets on Saturday, April 15, for nationally called Tax Marches. 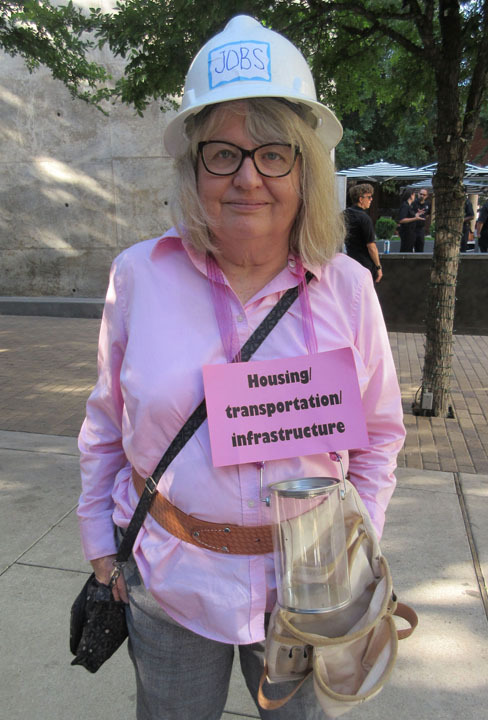 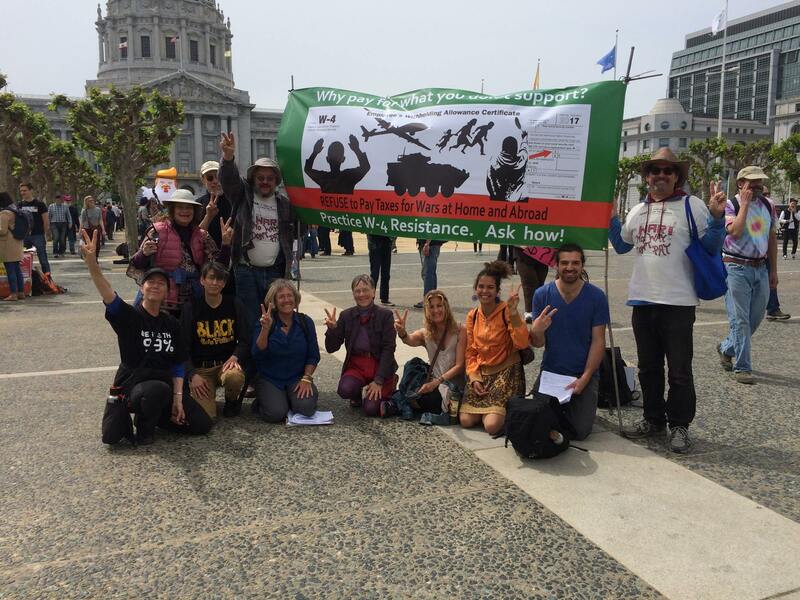 While the key demand was that Trump release his taxes, war tax resisters joined in cities across the country with banners and leaflets calling for military spending cuts and an end to using our money for war and violence. 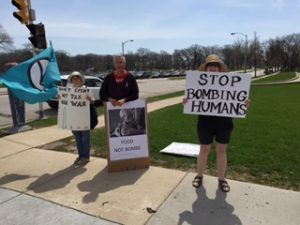 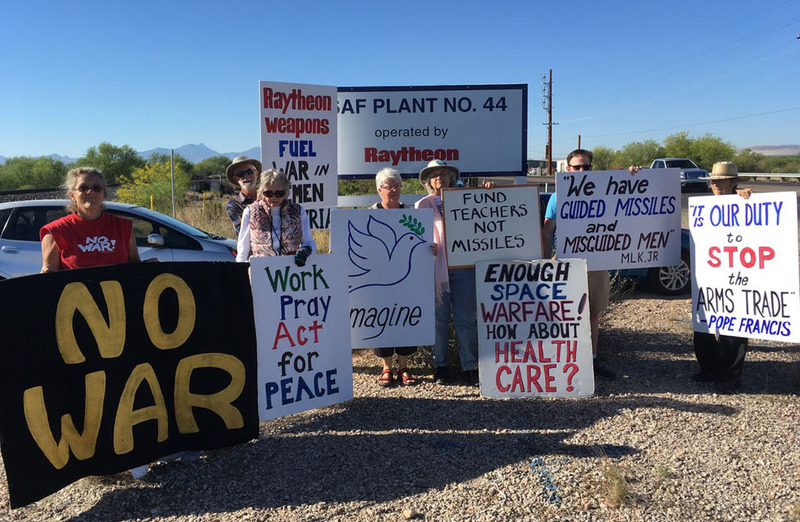 Through the weekend and the final day to file taxes on Tuesday, April 18, vigils and leafleting continued and groups held ceremonies to publicly redirect their tax dollars from war to people, peace, planet and justice. 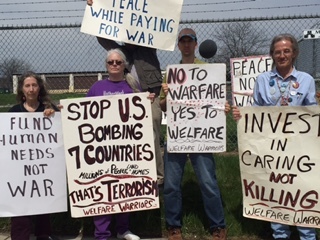 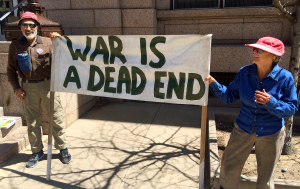 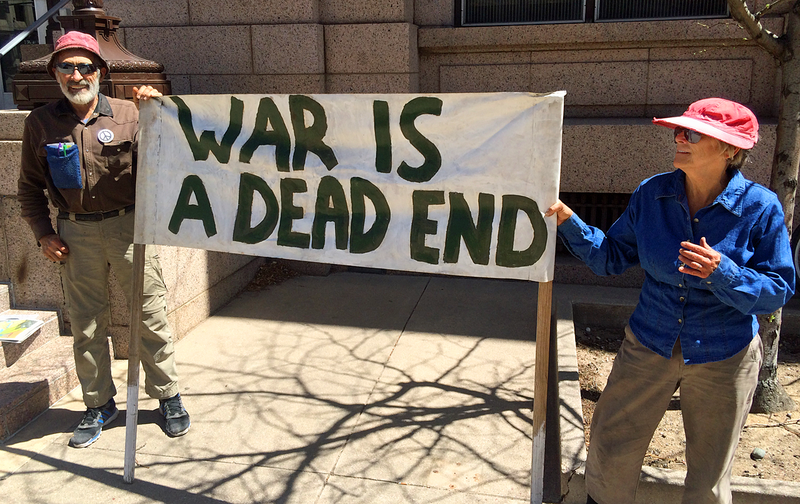 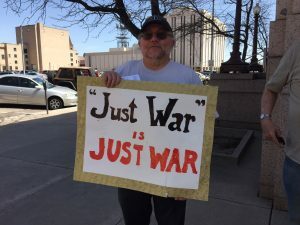 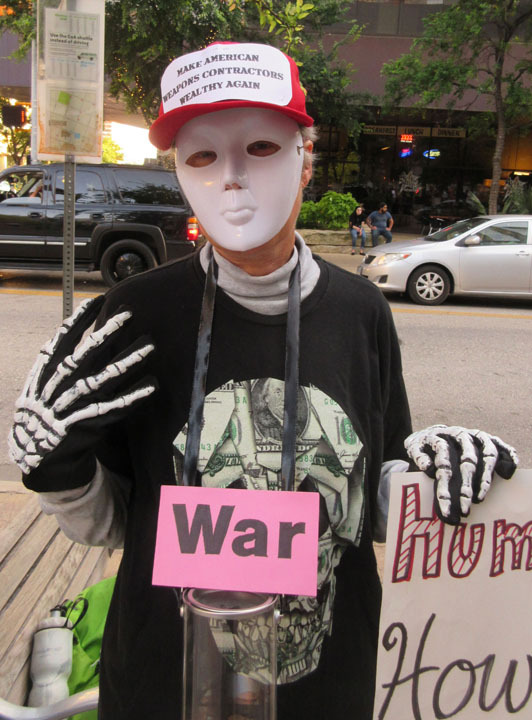 Members of the Bijou Community and Citizens for Peace in Space were out on Friday, April 14, in downtown Colorado Springs to remind passers by to think twice before paying for war. 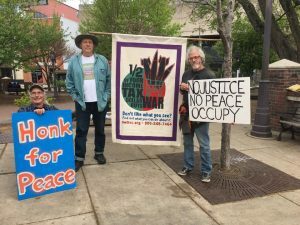 You can see a short video by Mark Lewis of the protest, which includes interviews with Bill Sulzman and Peter Sprunger-Froese. 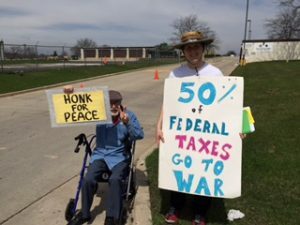 Bill says it’s about the 50th year they’ve been out on tax day! Photos by Donna Johnson and Mark Lewis. 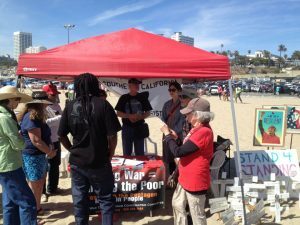 On Easter Sunday, April 15, the Southern California War Tax Resistance and Alternative Fund (SCWTR) redirected $6,000.00 in resisted war taxes to six local peace and justice organizations. 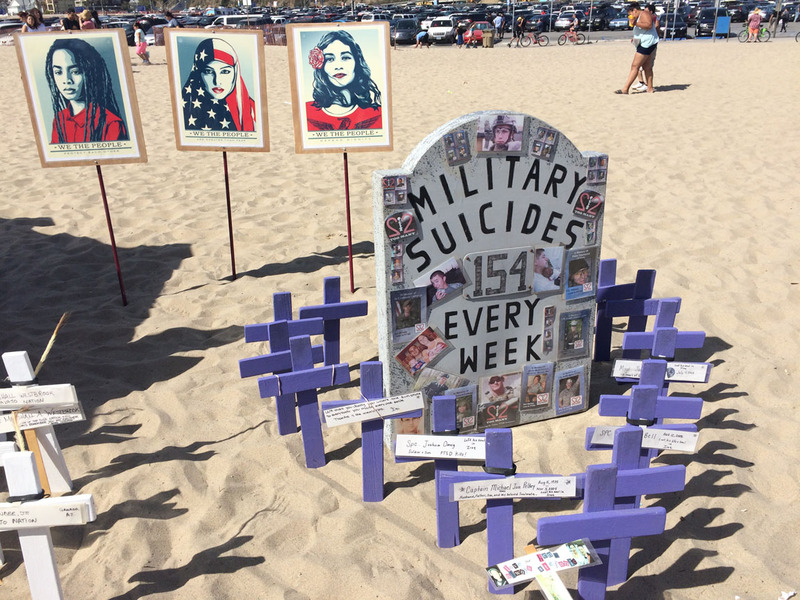 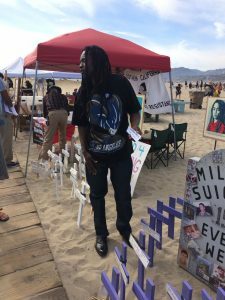 The Redirection was held at Santa Monica Pier, site of Arlington West, a project of Veterans for Peace, where crosses are placed to mark the deaths of U.S. military members in Iraq. 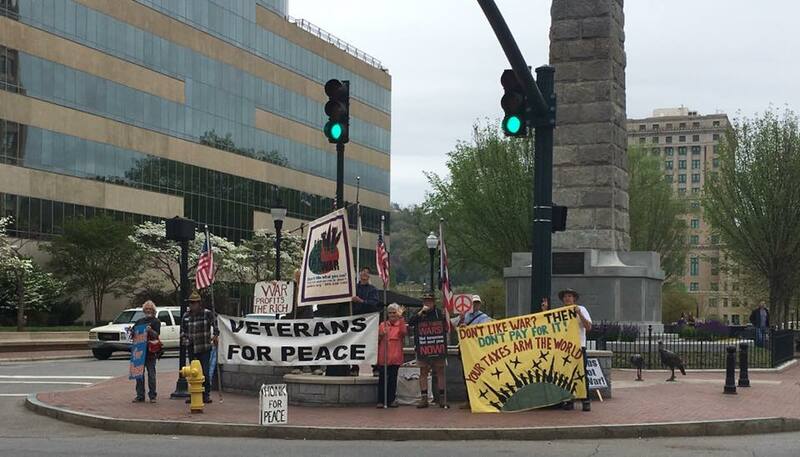 Left to right: Phillip Lester from Youth Justice Coalition placed a memorial cross for Christopher Murphy, a 30-year-old veteran of the Afghanistan War, who committed suicide just a few months ago in Concord, Massachusetts. 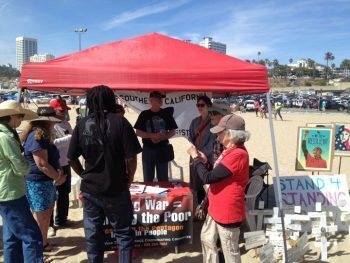 Southern California War Tax Alternative Fund held their redirection ceremony under a red tent on the beach near the Arlington West memorial. SCWTAF members Joe Maizlish and Frances Schneider-Liau talk with Phillip Lester, who picked up the check for the Youth Justice Coalition. 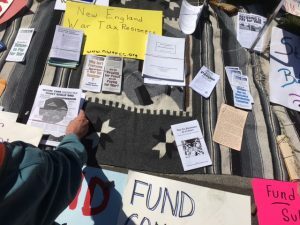 New England War Tax Resistance was a co-sponsor of the Tax Day Mobilization on April 15, the Patriots Day holiday, on the Commons in Boston. 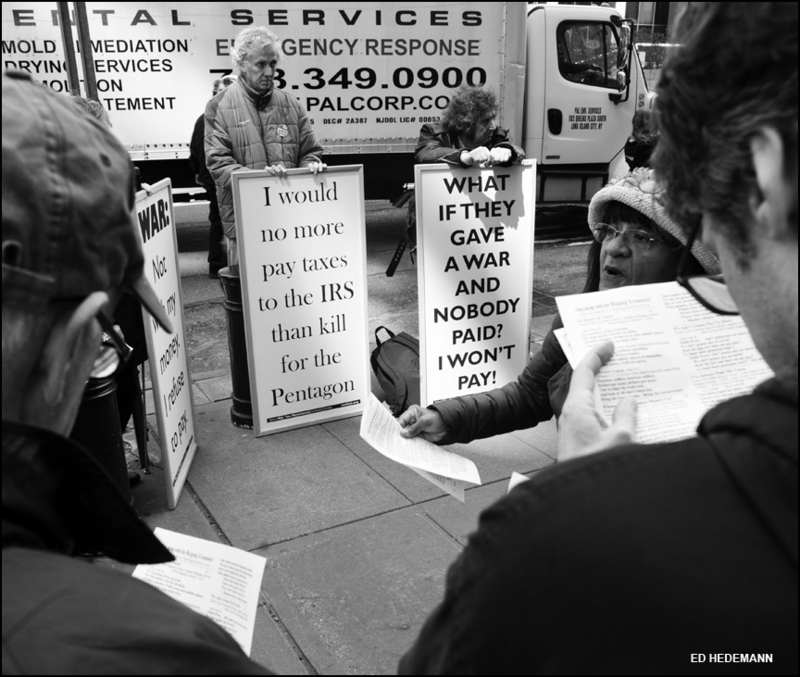 Billed as “A Call to all Patriots to stand up for our country in dangerous times” the rally went beyond other Tax Marches calling for Trump to release his taxes by including equal calls demanding big corporations and people with very high incomes pay their fair share of taxes and opposing Trump’s March 16 “Death Budget,” which cuts social programs and environmental protections in favor of more military spending. War tax resisters spread their literature out on a blanket along with other group’s displays offered to the thousands of passers by and march participants. 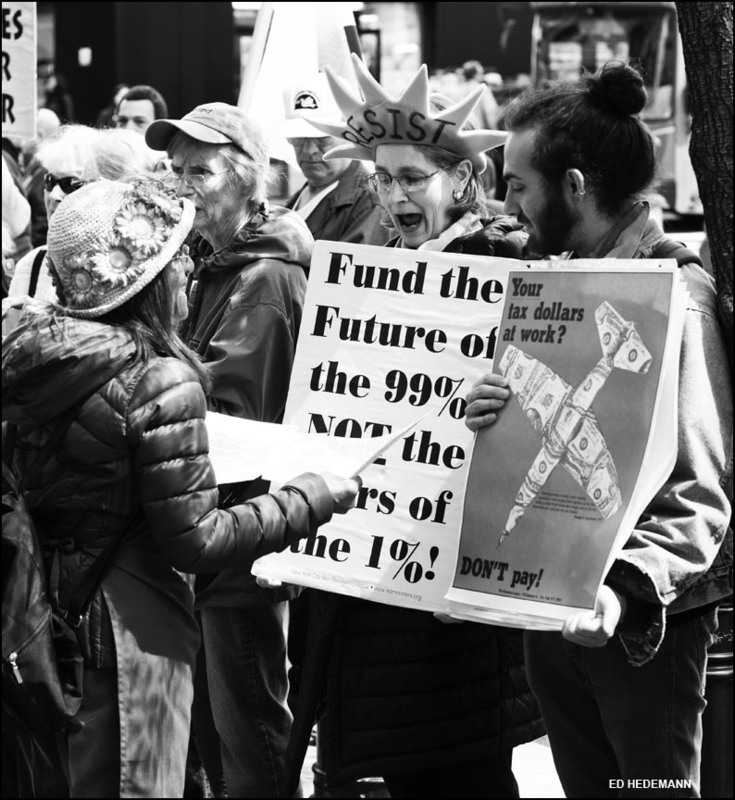 Photos by Craig Simpson. 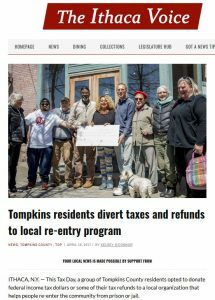 In Tompkins County, Ithaca War Tax Resisters joined their redirected tax dollars with donations from new group called Tax Strike 100 and publicly donated the money to the Ultimate Reentry Opportunity. 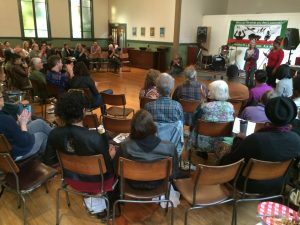 This is an initiative working on systemic change for people returning from jail and prison and is part of the MultiCultural Resource Center. 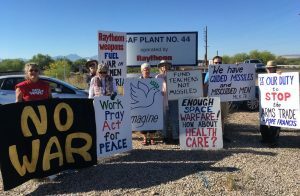 The redirection provided a positive alternatives to militarism and the Trump agenda. 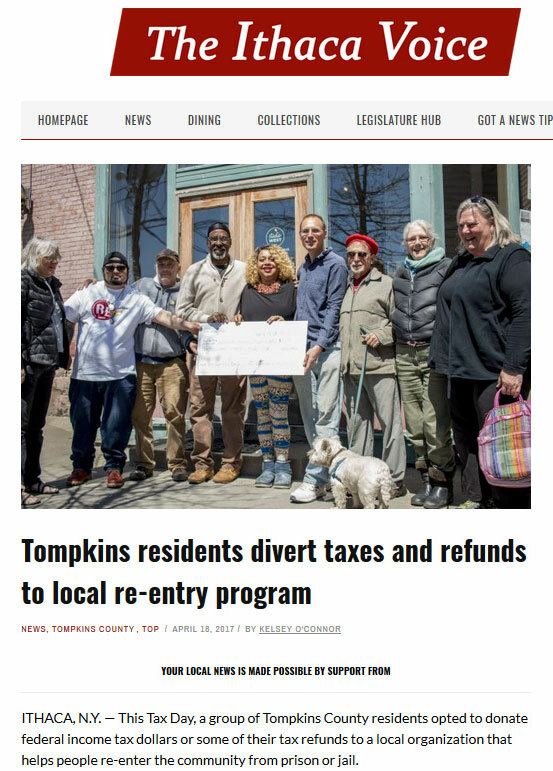 The Ithaca Voice ran a photos and story about the redirection. 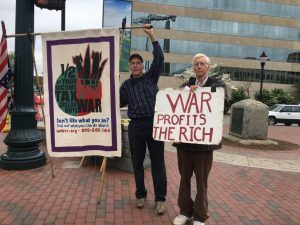 And Truthsayers posted a good blog write up called “No War, No Trump: Tax Resisters Withhold Support” about the Ithaca action. 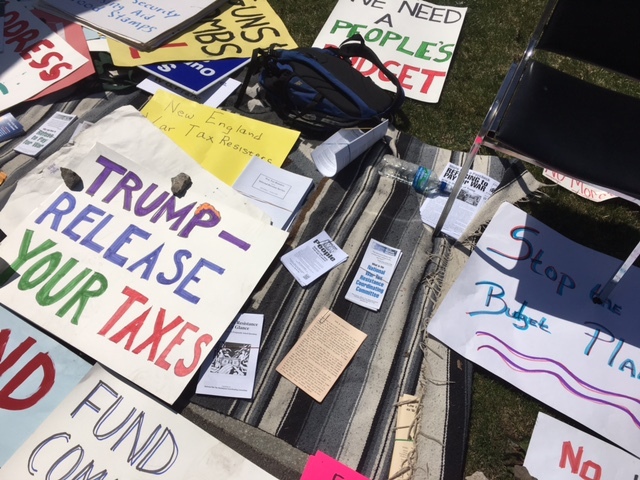 The annual tax day rally with street speaking, a penny poll, and leafleting was held on Tax Day, Tuesday, April 18, on the downtown Federal Plaza. 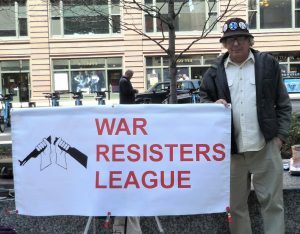 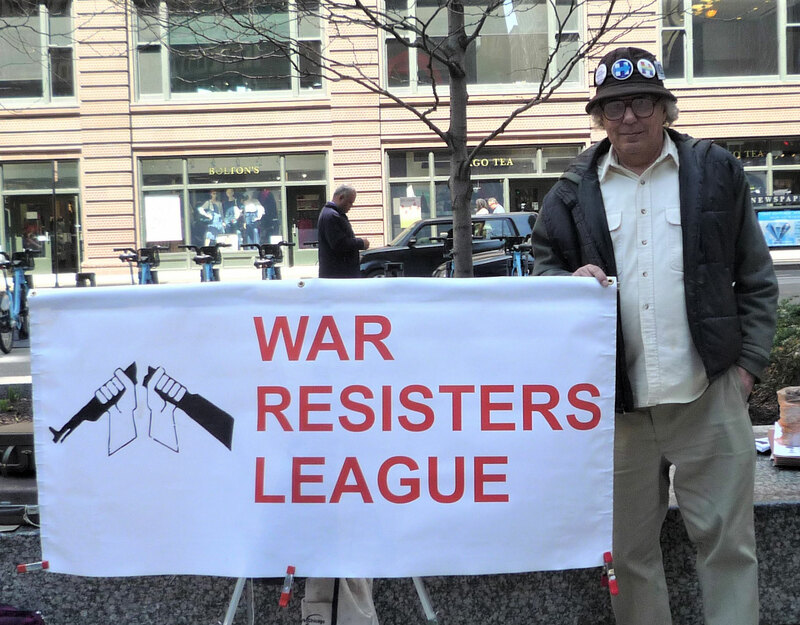 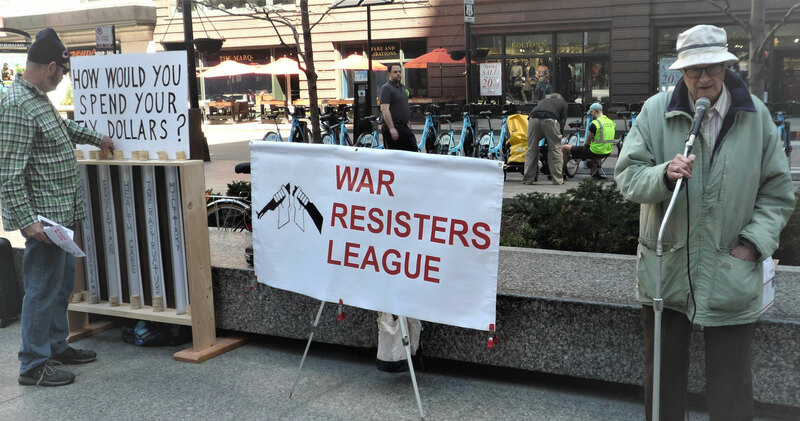 Participating groups included War Resisters League/Chicago and the Chicago Area War Resisters Support Group. 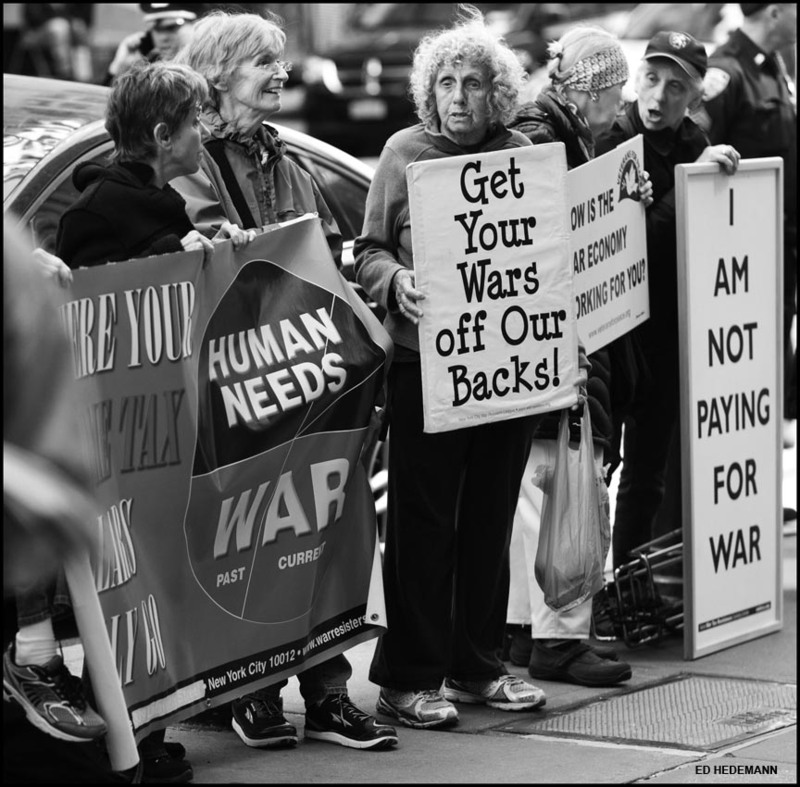 Photos by Charles Paidock. 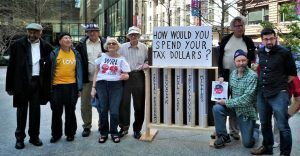 Some of the organizers and attendees pose with what might be the most solid penny poll set up we’ve ever created! 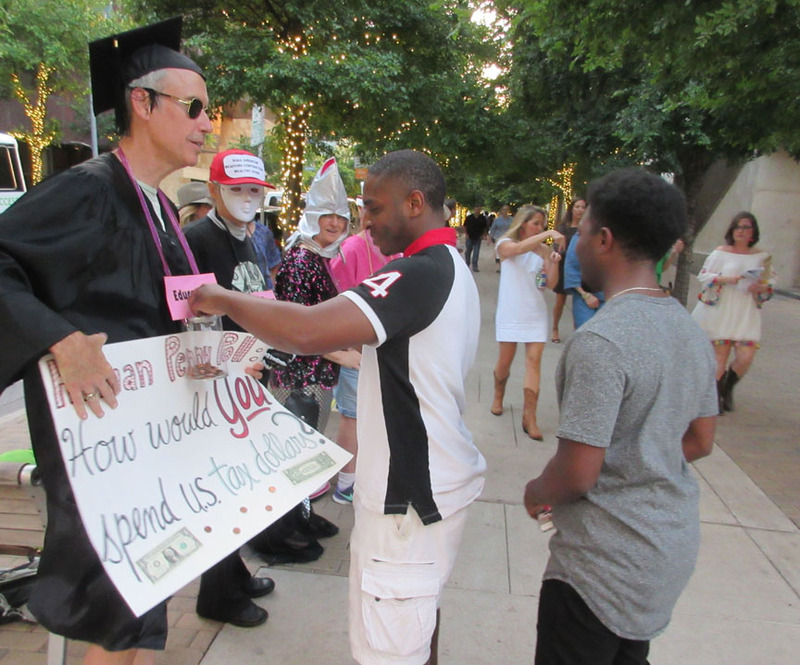 Event organizer Brad Lyttle, speaking, with a passer by making his penny poll selections. 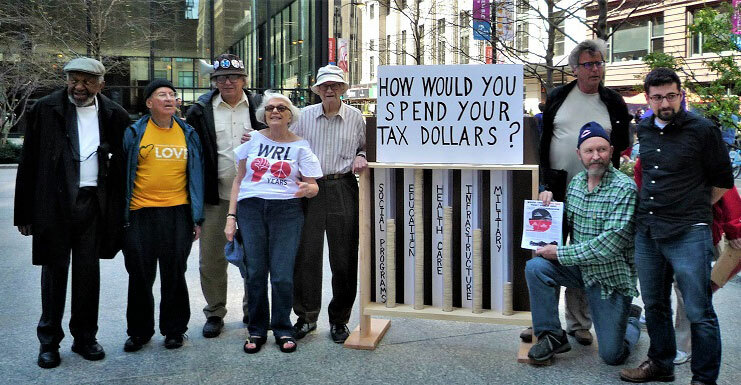 WRL member and author Rosalie Riegle explains the pie chart and the problem of military spending. 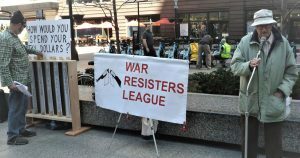 WRL/Chicago organizer Charles Paidock on banner duty. 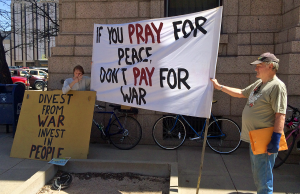 Taxes for Peace! Eugene joined over 800 people at a Tax March and rally on April 15. 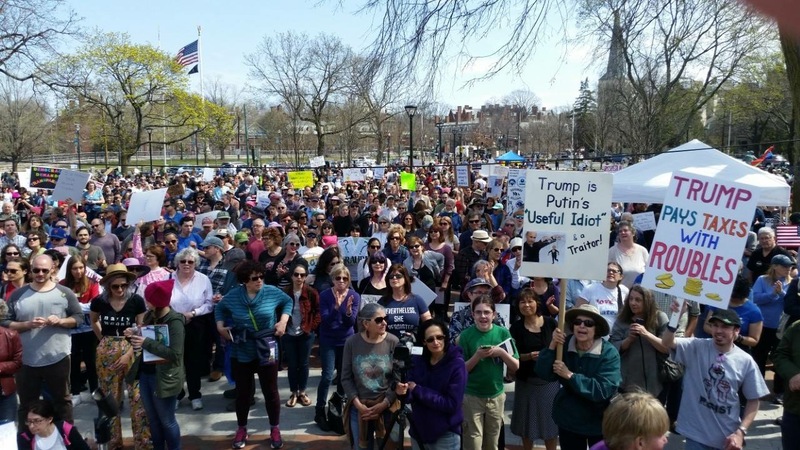 They marched a few miles around town and the rally in a park featured booths from over 20 local groups. 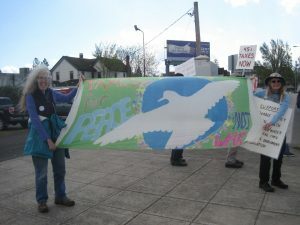 A coalition including Taxes for Peace!, Community Alliance of Lane County (CALC), ESSN, WAND, Indivisible Eugene, and others put on the march and rally, which featured a diverse group of speakers including Congressman Peter Defazio; Eric Richardson, NAACP President; Naomi Walkman, local High school student and recipient of a Peace scholarship that CALC does each year; environmentalist Loretta Houston; and Sue Barnhart talking about War tax resistance. Singing groups included the Raging Grannies and the SIEU labor chorus. A percussion group, Samba Ja, led the march. 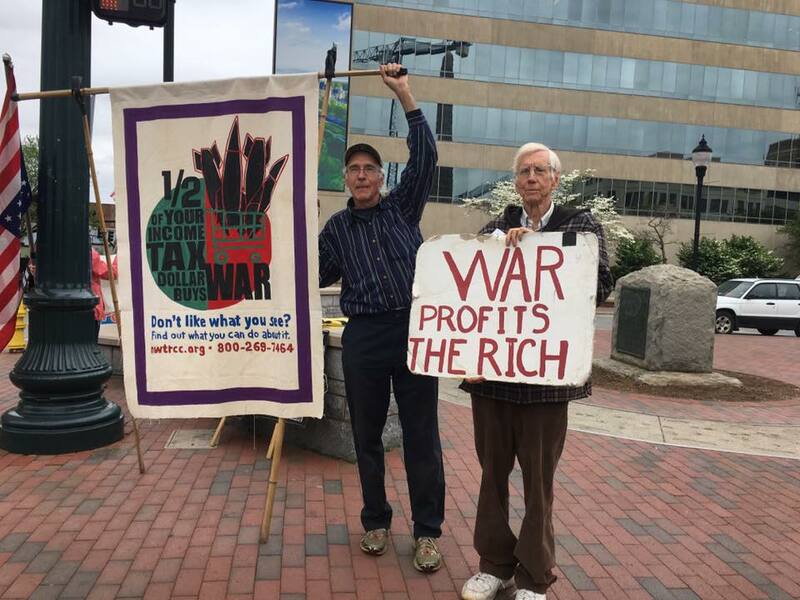 Taxes for Peace! 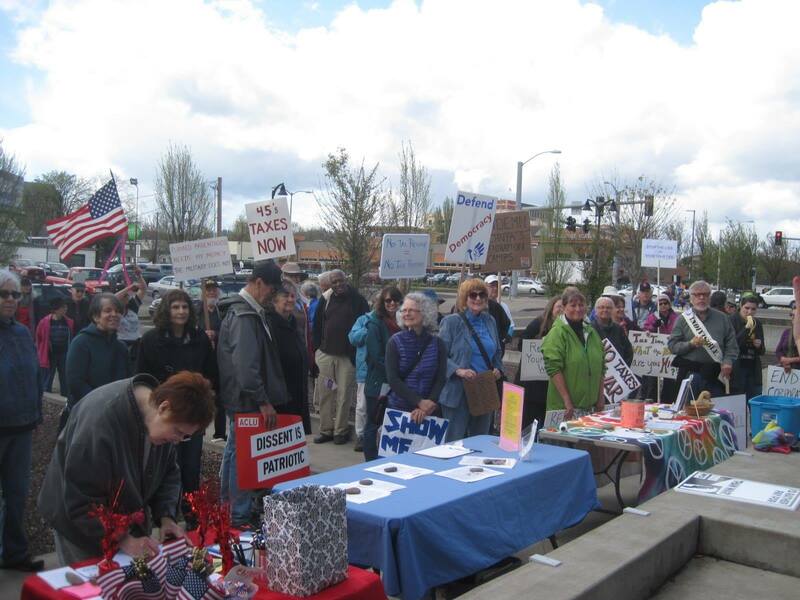 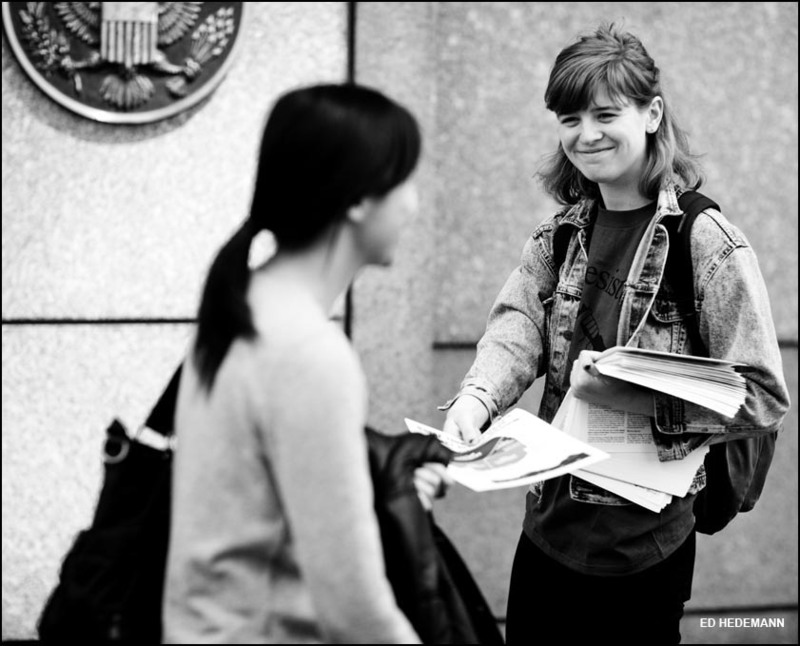 and CALC also held their traditional Tax Day rally on April 18. 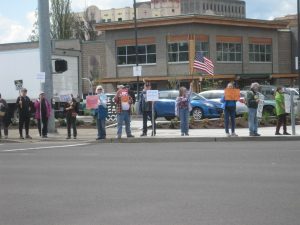 At the last minute they joined two new groups that have formed since Trump was elected, Indivisible Eugene and Take Action Eugene at the New Federal Building. 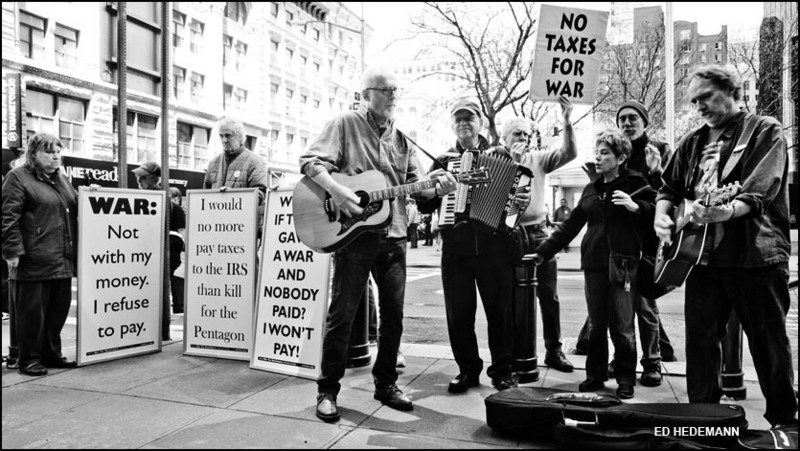 Taxes for Peace! 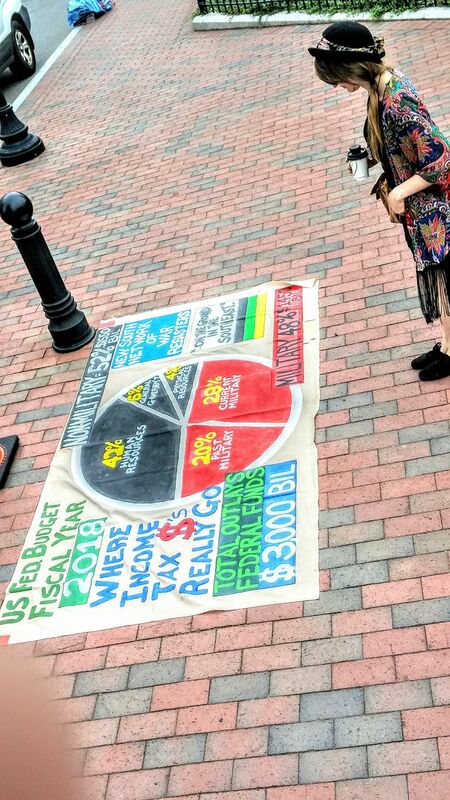 announced which local groups we were giving our resisted money to and rolled out a long bar graph that shows where our tax money goes to, which was very educational for these mainly new and very enthusiastic activists. 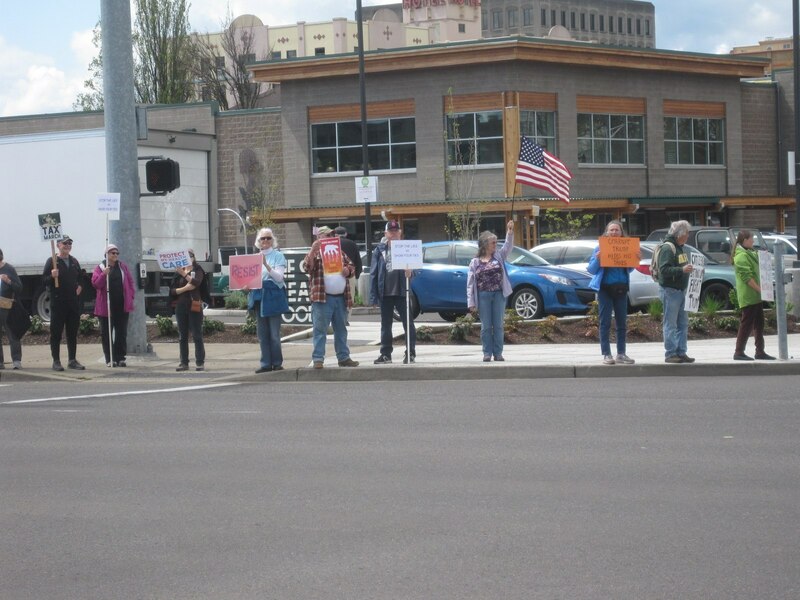 Literature and the penny poll inspired many asked us questions and then we all held up signs as the traffic went by. 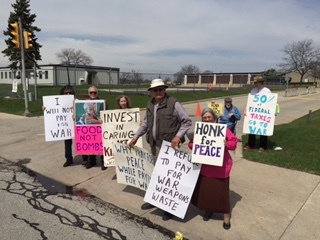 Many of the cars that went by honked in support. 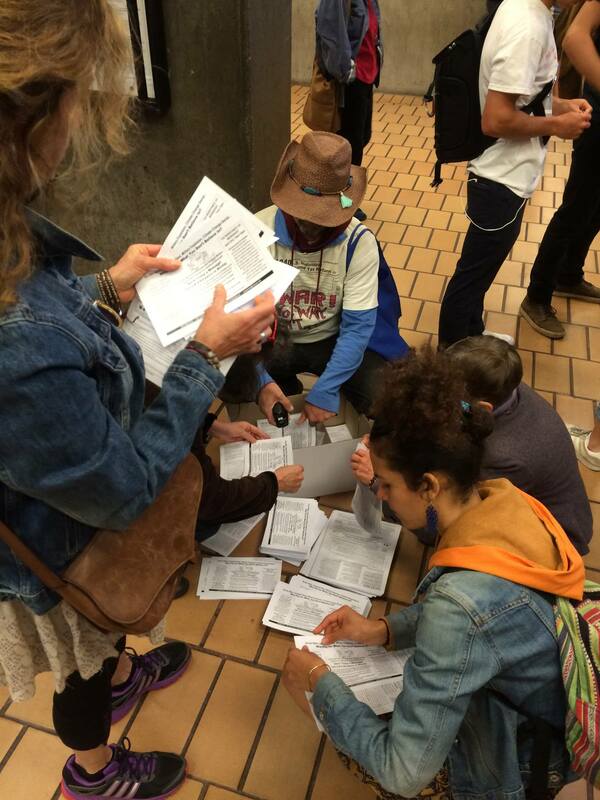 Photos by Jain Elliott and report from Sue Barnhart. 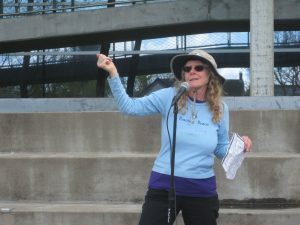 Sue Barnhart announcing tax redirections. 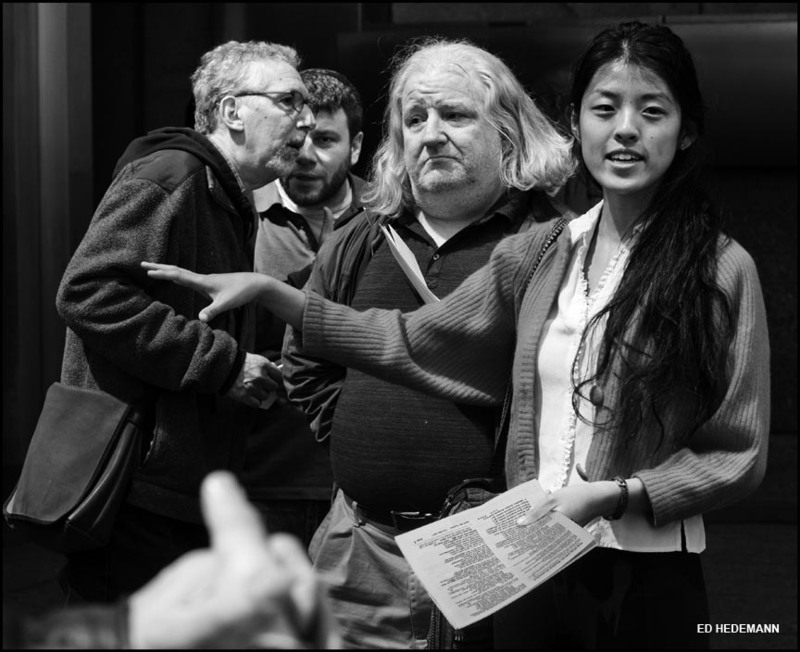 Filthy Rotten System kept things lively during the NYC tax day vigil. 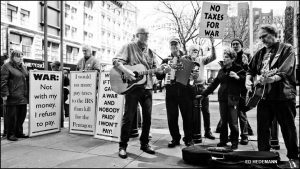 The annual tax day demonstration at the IRS on Broadway in downtown Manhattan was a lively affair with members of sponsoring groups in attendance: NYC War Resisters League, Brooklyn For Peace, World Can’t Wait, NYC Metro Raging Grannies, Pax Christi Metro New York, NYC Catholic Worker, Granny Peace Brigade, Peace Action NYS. 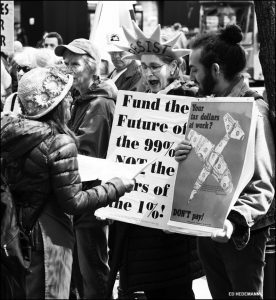 The New York City People’s Life Fund gave out $2,000 in redirected tax dollars to four groups. Huffington Post featured a live stream of the event on their Facebook page (much to the surprise of the vigilers! 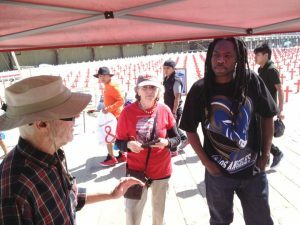 ), and many other media photographers stopped by. 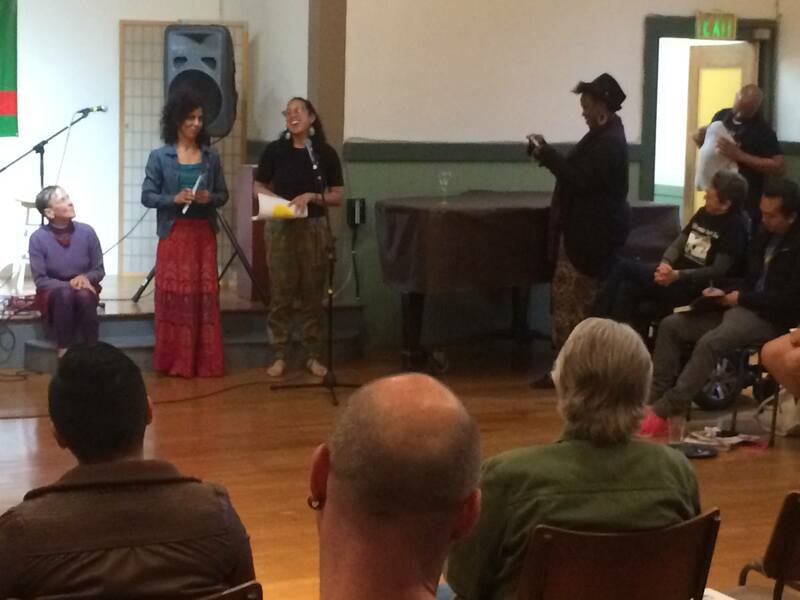 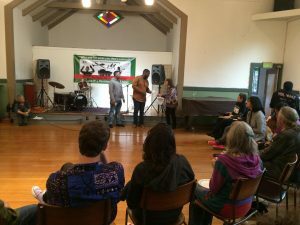 gave out grants totally $2,000 to DRUM – South Asian Organizing Center (formerly Desis Rising Up and Moving), and to Superhero Clubhouse, a collective of artists and scientists working at the intersection of environmentalism and theater. 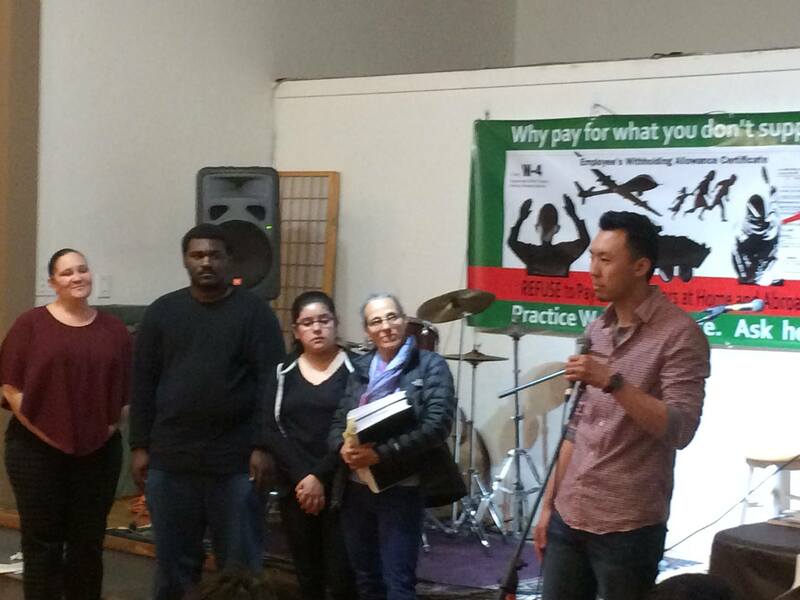 The check was accepted by Lanxing Fu (bottom left photo) . 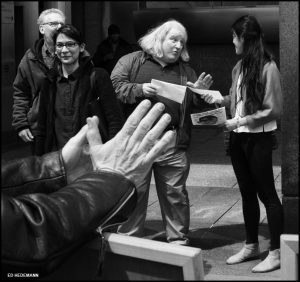 Photos by Ed Hedemann. Fools of Conscience hit the steets on tax day, loitering around downtown Asheville and attracting the attention of drivers and other passers by. Photos by Clare Hanrahan. 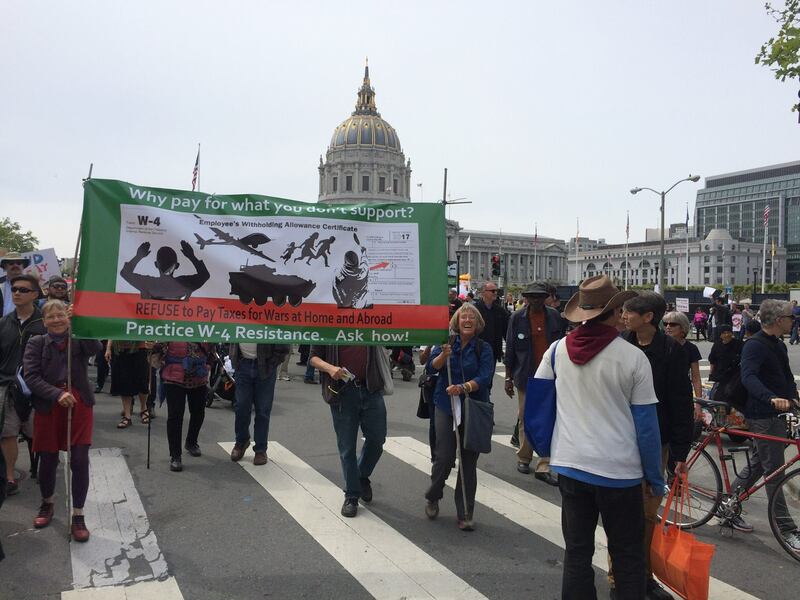 Northern California People Life Fund joined the April 15 Tax March with a new banner and flyer about W-4 resistance to help potential war tax resisters prepare for tax season 2018. 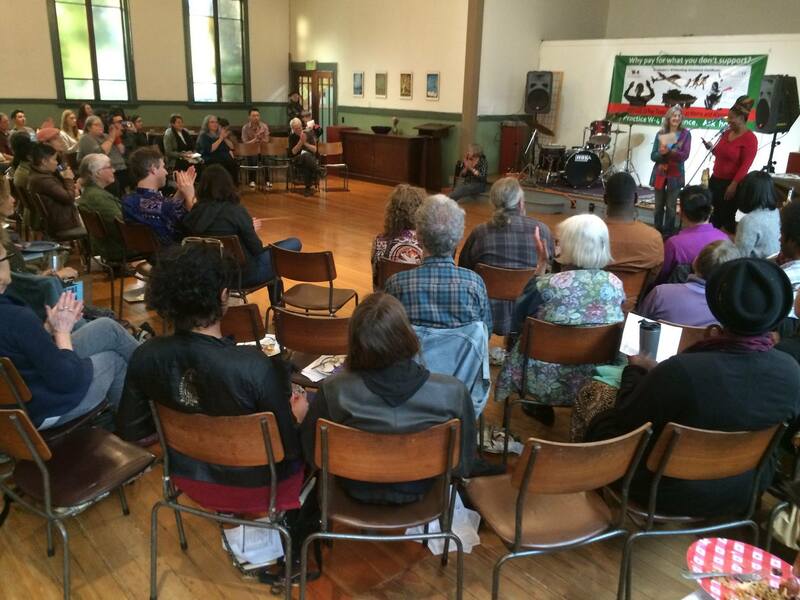 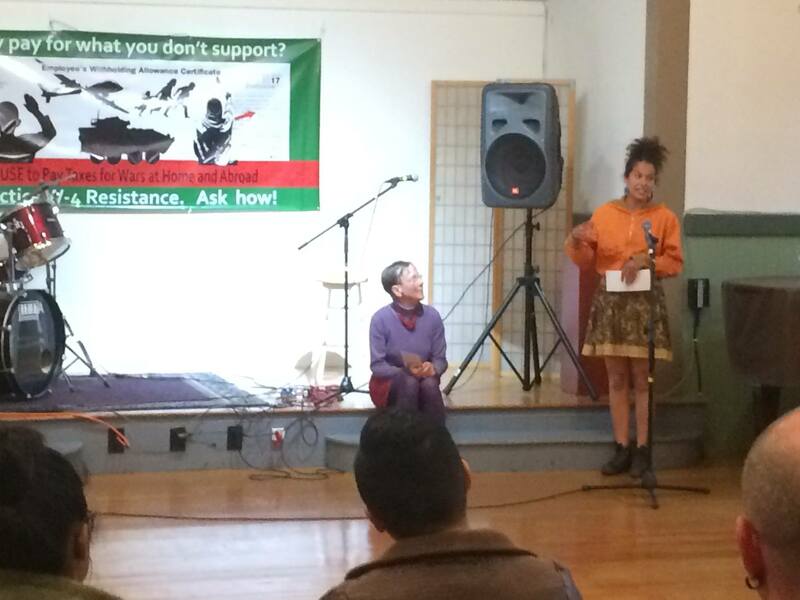 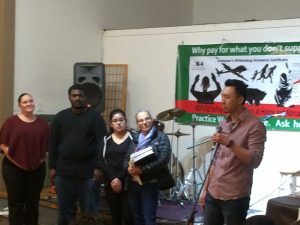 Later the same day, they gathered at the BFUU Fellowship Hall in Berkeley and gave out $32,000 in redirected taxes to twenty-six amazing peace and justice organizations! The evening program started with music by Kevbot with the Roots Rising, followed by a potluck dinner and the Granting Ceremony. 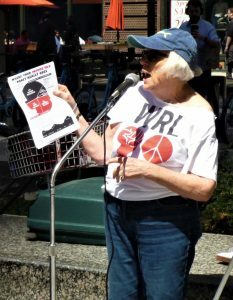 Maine WTR Resource Center organizer Ginny Schneider reports that this war tax resistance season was even bigger than last year’s. We increased Resist War actions to 17 from 11, and we had more than 35 people volunteer to leaflet and table from Portland up to Machias. 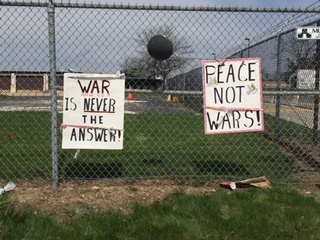 They began on 3/5 and continued through 4/18. 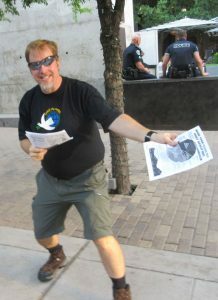 Over 35 volunteers participated in the actions. 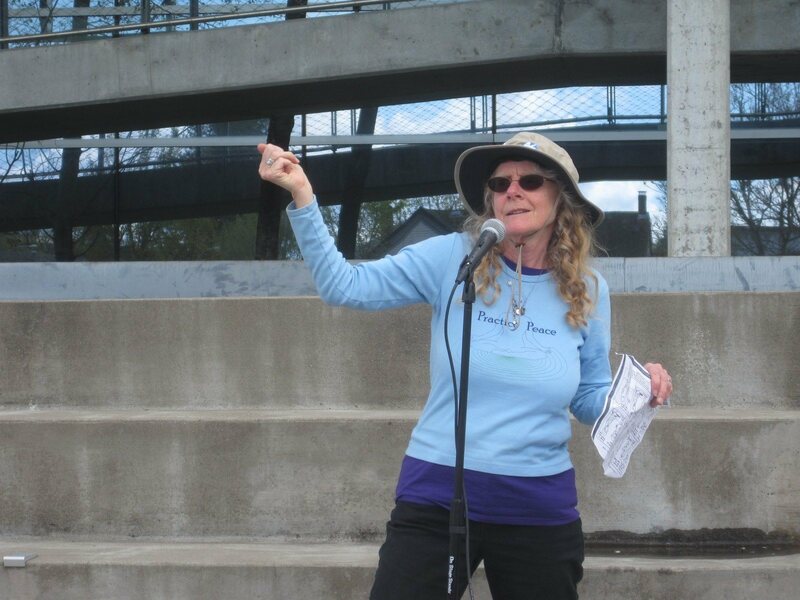 One of the highlights was that a UMaine, Farmington, professor brought her entire class to the the WTR table. 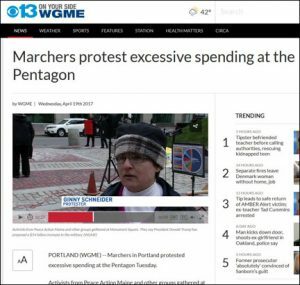 Ginny (left) was interviewed on Portland stations WGME at the tax day protest at Monument Square. “We’re speaking out on the imbalance of the budget. That most of our taxes are really paying for war and killing. 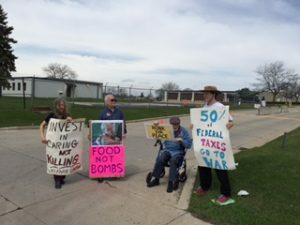 And the whole safety net is being whipped out from under everybody to pay for this and we do not support that kind of a budget,” says Ginny. 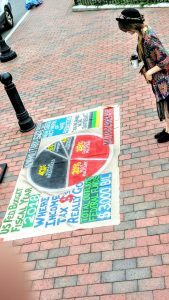 Waterville, Maine featured a penny poll set up next to the Waterville Opera House where a matinee of The Little Mermaid was being presented. 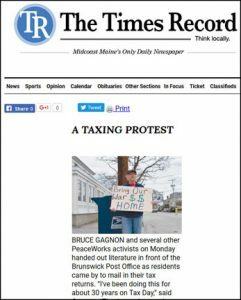 The penny poll drew 51 responses from passersby on the main street of this former mill town. 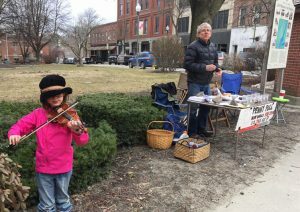 A young busker helped draw attention to the action. 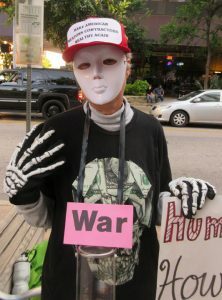 See a full report on Lisa Savage’s blog, Went 2 the Bridge. Results: Health Care and Environment received exactly the same number of pennies, at 26.4%, Education was a close second at 26.3%, Housing/Infrastructure/Jobs came in at 16% and War at 4.9%. Was there a Tax Day action in your community? 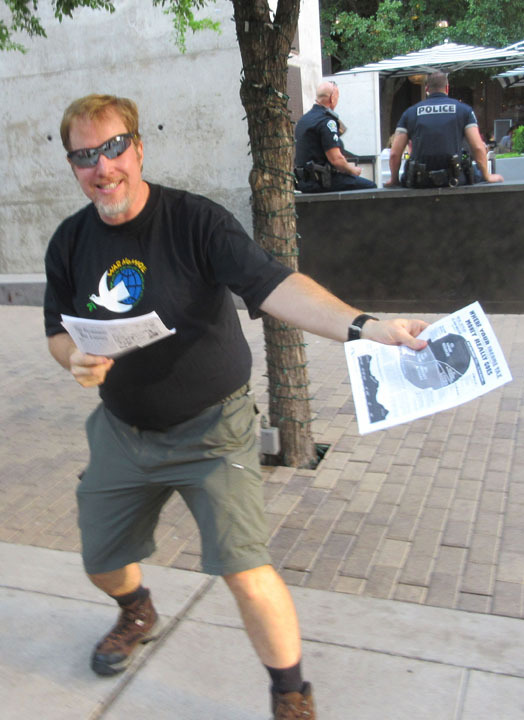 Email your report, with or without photos, to NWTRCC.